The Philippines imports a whopping P7 billion worth of coffee per year to address local demand, but this is an industry local agribusinesses can invest in to augment domestic production. Atty. Salvador D. Diputado, Central Visayas Regional Executive Director for the Department of Agriculture, revealed as much at the “Water & Agri Forum: Accelerating Water and Agriculture Innovation” at the Marco Polo Plaza Hotel held in June 29, 2017 in Cebu. The forum was part of Colors of ISRAEL Cebu, presented by the Embassy of Israel in the Philippines in cooperation with the Israel Chamber of Commerce of the Philippines (ICCP) and Cebu Chamber of Commerce and Industry (CCCI). Israel has always been persistent about forming professional relationships and business partnerships with Philippine companies. The Cebu forum encouraged collaborative opportunities for both countries to improve water and agricultural systems. 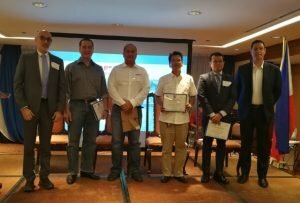 Alongside the enthusiasm from Israel’s end, Filipino entrepreneurs and leaders were keen on presenting their knowledge and skills in the forum. The Cebu-based stakeholders joined the discussion on potential businesses as well as innovative practices wherein Israel can help them. Agriculture consumes 70% of the global fresh water supply, according to presenter Alex Gamutan, President of Netaphils Inc. and the representative of NETAFIM, an Israeli pioneer of drip and micro-irrigation products. in the forum. He talked about drip and micro irrigation (or nutrigation) as a cost-efficient solution his company supports and promotes. Angelo Valenton, CEO of POWER 4 ALL, a provider of clean water and power resources to communities, representing Odis Filtering Ltd, one of the world’s leading Israeli companies in development, design and manufacture of filters, water and wastewater treatment systems, presented a study that showed the relevance of Israel’s water crisis and technology know-how to the way the nation solved its problems. Just like Israel, the Philippines can benefit from integrated and self-contained water treatment systems to achieve a cost-effective solution to water pollution. Engineer Edgar Sibonga, Executive Director of Provincial Water Resources Authority Cebu also discussed the water conditions of Cebu. With a goal of serving 80% of the population with level III water service by 2030, his company proposes an alliance with Israel to further push for the proper utilization of water resources. Israel and the Philippines both aim for a more sustainable and economic nation. With stronger ties and more collaborative efforts, the future looks bright.